When pairs trading, we trade a pair of securities that are correlated with each other by taking a long position on one of them and a short position on the other. Pairs trading lowers risk over having a single position (either long or short) on a single security. When pairs trading you can use ETFs, stocks, futures and options as you’ll see below. In addition to lowering risk, another huge advantage to using pairs trading is that there are five different ways to profit instead of just one, as you’ll see below. After almost 30 years of trading professionally and over 10 years of teaching others to trade with a focus on risk management, pairs trading remains a favorite strategy. In this article, first we’ll address pairs trading with options vs underlying securities. Then we’ll walk through an example demonstrating pairs trading with a spread chart, while showing how to calculate the gain. We’ll list the five possible ways to profit with pairs trading, and we’ll talk about when we might want to use this trading strategy and why. Then we’ll illustrate the concept further with three more examples using ETFs, stocks and futures. Note that different types of trading vehicles can be used in structuring pairs trading as on the examples below. For example, sometimes stocks are paired with one another, or with ETFs, or ETFs are paired with one another. 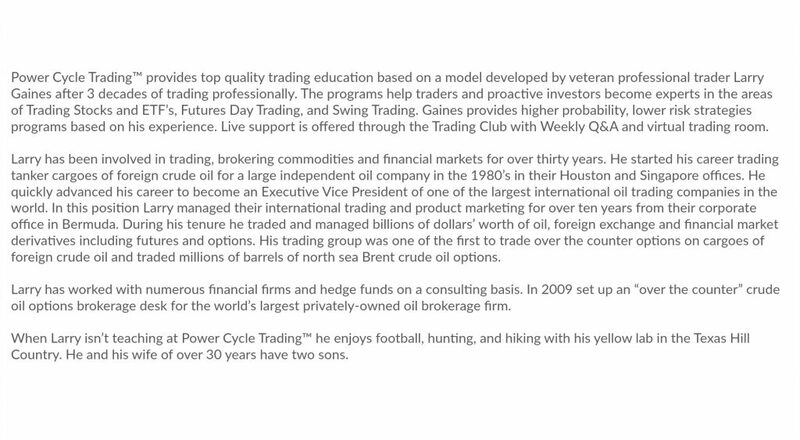 If you want to learn more about Pairs Trading with Options, click here to see my course. The examples below represent 100 shares of the securities, specifically being long 100 shares and short 100 shares of the other security. If we want to do pairs trading using options instead of underlying securities, we could use a synthetic long structure with a synthetic short structure. 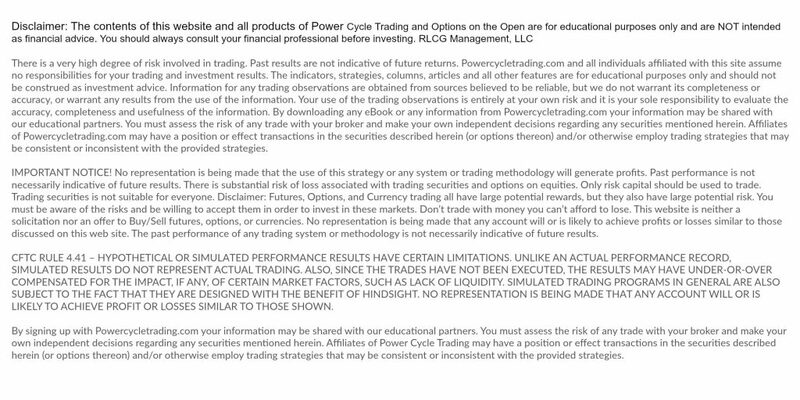 Remember that 1 option contract is equivalent to 100 shares of the underlying security. While using options for pairs trading is more complex, it takes less capital to structure pairs trading using options vs. the underlying securities. Additionally, we won’t have to borrow the shares to short when pairs trading using options vs using the underlying securities. For simplicity, we’ll use underlying securities instead of options in the examples below to illustrate how pairs trading works. Let’s start by looking at an example of a pairs trade on AAPL to see how it works. For this example, we’ll use Apple (AAPL) and the NASDAQ 100 ETF QQQ. Note that AAPL is a stock and QQQ is an exchange-traded fund (ETF); any combination of instruments is fine as long as the two are correlated with each other. They could be stocks, ETFs or commodities, for example. For pairs trading, we are interested in the difference (spread) between the prices of the two instruments rather than in their individual prices. Here is a chart of the spread between AAPL and QQQ. The solid line tracks the difference in their prices: AAPL minus QQQ. Let’s say that on July 31, we established a pairs trade using options to take a long position on AAPL and a short position on QQQ. On that date, the difference was $14.32 per share. By August 17, the difference had shot up to $37.72 per share. So between July 31 and August 17, the spread moved upward $23.40 per share. Since we are trading options and 1 option contract is equivalent to 100 shares per contract, that move represents a gain of $2,340 per contract. Now let’s see how this gain was created by AAPL and QQQ as they moved individually. 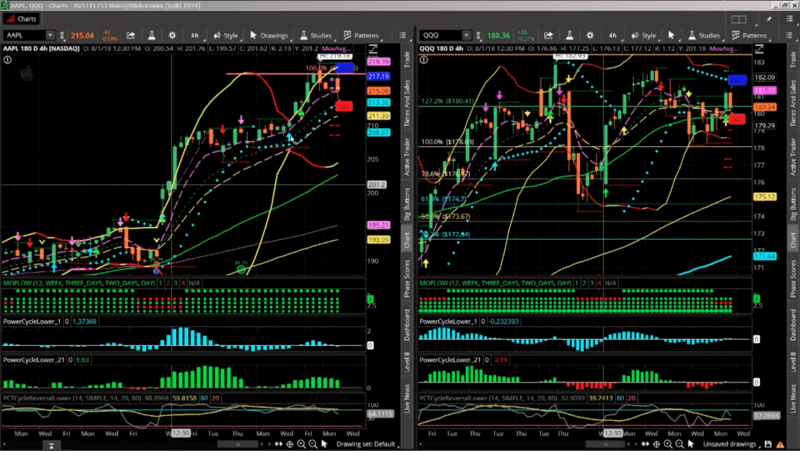 Here we’re looking at the four hour charts for AAPL (left) and QQQ (right). 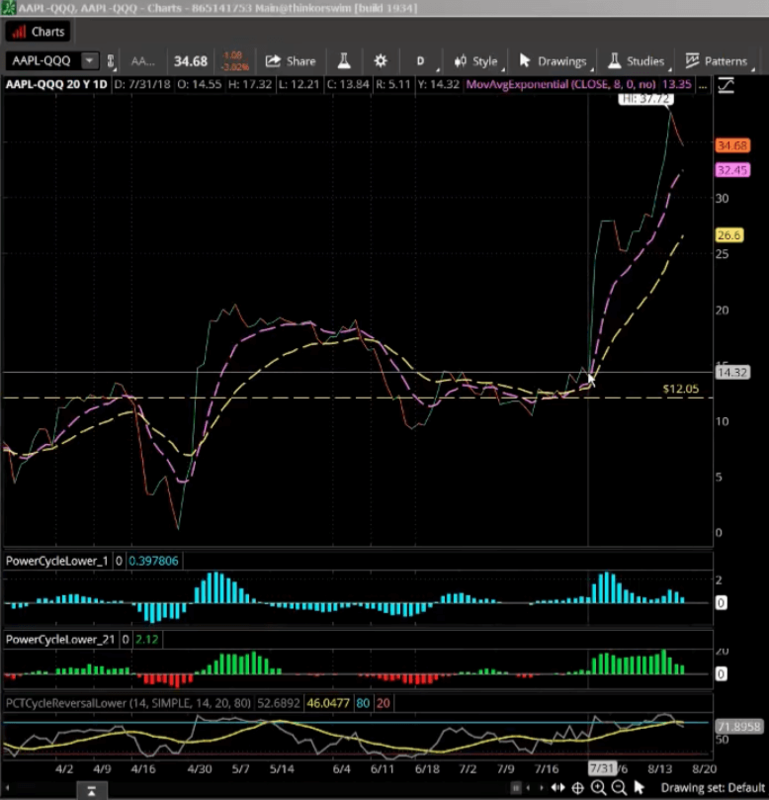 About in the middle of the AAPL chart on the left, you can see that AAPL exploded upward. This was on August 1, just after Apple released its earnings report. The price moved sideways for a bit and then took another leg up. During that same period, QQQ also moved up at first, but then it stalled out and pulled back somewhat. So in this example, both instruments moved up, but AAPL moved up faster than QQQ. It was the combination of AAPL’s sharp upward moves and QQQ’s milder upward move that caused the spread (AAPL minus QQQ) to shoot up. Since we were long AAPL and short QQQ, we had a gain with this pairs trade. In our example with AAPL and QQQ above, both instruments moved up, but there was still a net gain because our long position (AAPL) moved up faster than our short position (QQQ). This is one scenario that will create a gain, but there are actually five possible ways to profit with pairs trading using options. Our long position rises faster than our short position (as in our example above). Our long position rises, and our short position stays flat. Our long position stays flat, and our short position falls. Our long position falls, but our short position falls faster. Our long position rises, and our short position falls. This is in sharp contrast with the strategy of trading a single instrument. If we had traded only AAPL (long), there would have been only one way to profit: AAPL would have had to rise. On the other hand, if we had traded only QQQ (short), the only way to profit would have been for QQQ to fall. Pairs trading has the advantage of providing five possible ways to profit and can be done using options. The beauty of pairs trading is that it allows you to be right, even when you’re wrong. This happens rarely in life, especially when it comes to your finances. On the left, we see the NASDAQ 100 ETF QQQ, which has gone down and up in the last few days; then we see the S&P index (SPX), also looking uncertain; then the Russell 2000 ETF IWM, going sharply down; and on the right, the Dow Jones futures (YM), heading straight up. Pairs trading is a good strategy to consider in times of market confusion like this. This is because pairs trading is a market neutral strategy. In other words, it doesn’t matter whether markets are going up, down, or sideways. This strategy works the same regardless. The reason is that with pairs trading, we’re not trading an individual instrument but rather the relationship (difference) between two correlated instruments (which can be stocks, ETFs, or commodities). Therefore, we can make money whether our long position goes up, down, or sideways, and we can make money whether our short position goes up, down, or sideways, as long as the combined result fits one of the five patterns listed under “Five Ways to Profit,” above. A key reason for using pairs trading is to reduce the risk of loss. If you take a single position with an individual instrument, you are fully exposed to loss if the market moves in a direction you didn’t expect. But with pairs trading, since you are matching long and short positions on a pair of correlated instruments, you have less exposure to loss even if the markets crater overnight, for example. 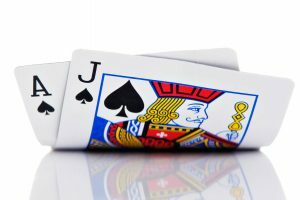 Pairs trading is a technique commonly used by big hedge funds, but it can be used by smaller traders as well to mitigate their risk of loss. Many smaller traders forget to use this strategy, or perhaps they neglect it simply because they have never learned how to apply it. This examples trades two ETFs that are correlated with each other: the NASDAQ 100 ETF QQQ and the Russell 2000 ETF IWM. Look again at the previous chart, which shows (left to right) QQQ, SPX, IWM, and YM. The Russell ETF (IWM) has broken the moving averages and is moving down, so it’s sending a Sell signal. QQQ, on the other hand, is holding steady against its moving averages. So we’re going to short the Russell ETF and go long on QQQ, again trading the pair using options, at 100 shares per contract. 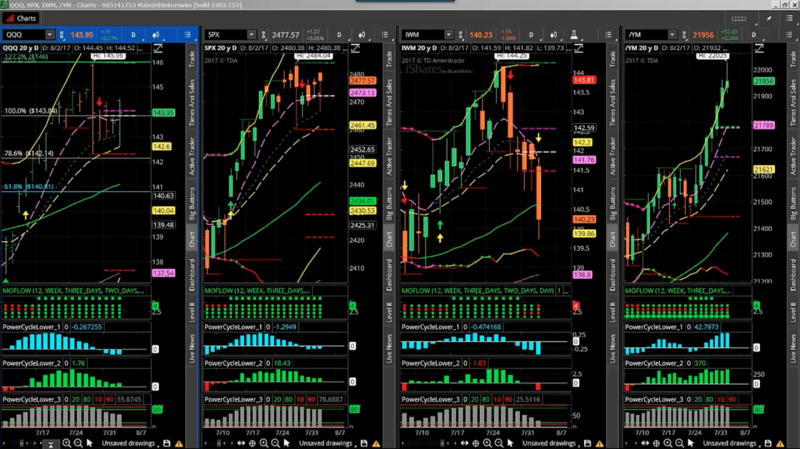 The light blue bars near the bottom of the screen show the Cycle 1 momentum indicator, which goes negative on July 5, just to the left of the vertical cross hair line. Below that is a line chart showing the overbought/oversold indicator, which crosses the horizontal line downward (meaning that it is no longer overbought) on the Monday just left of the vertical cross hair. Let’s say we took those signals and entered the trade at that point, selling short the Russell ETF and buying QQQ at the same time. The spread was $3.11, or say about $3, for the Russell ETF over QQQ. After we entered the trade, the spread decreased and became negative so that the current value at the end of the chart period (August 2) was −$3.70. The value of the Russell ETF price minus the QQQ price is now negative, which means that the Russell ETF price is now lower than the QQQ price. The change in the spread between the trade entry point and August 2 is the difference between −$3.70 and about $3, or about $6.70 per share. Although the spread declined in this example, it indicates a gain for us because, remember, we sold the Russell ETF short. And at 100 shares per options contract, a gain of $6.70 per share represents a gain of $670 per contract or per 100 shares. With this style of trade using two correlated ETFs that gave conflicting signals, we were able to lower the systemic risk caused by the uncertainties in the overall markets. Back in October and November 2016 (around the middle of the chart), our technical indicators showed a reversal pattern, followed by Cycle 1 and 2 momentum indicators going positive, and the spread had a breakout and started trading to the upside. 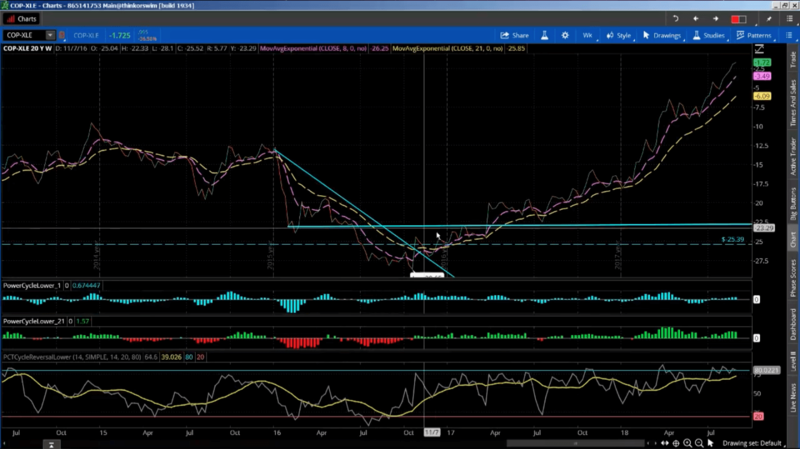 At that point, the spread was −$25.39, marked by the light blue dashed line across the middle. The fact that the spread was negative just means that the COP share price was less than the XLE share price. 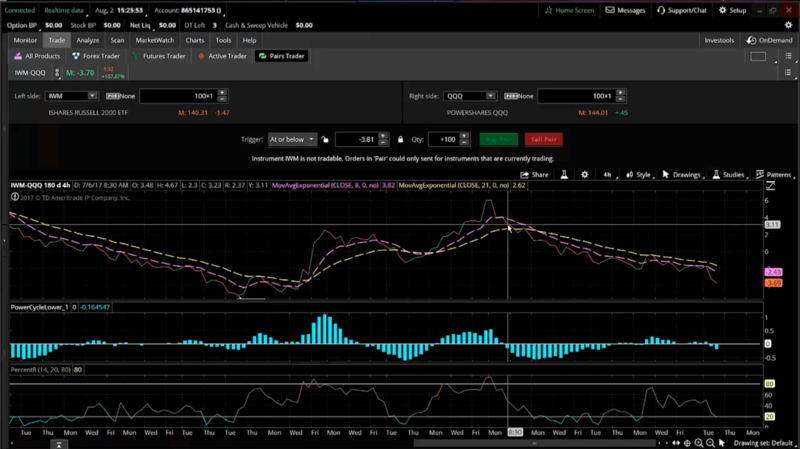 By August 2018 (the end of the time period spanned by the chart), the spread had risen to −$1.72. This represents a gain of $23.67 per share. Since we are trading pairs using options at 100 shares per contract, that is a total gain of $2,367 per contract or per 100 shares. Now let’s go behind the scenes and check out how COP and XLE individually contributed to this steady rise in the spread between them. 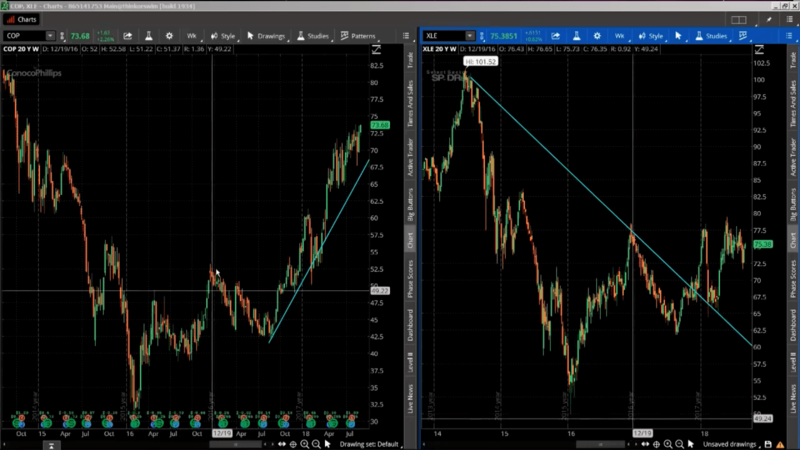 Here we see the weekly charts for COP on the left and XLE on the right. COP began to move upward from the bottom of the chart early in 2016, then had a pullback, rose again to a high in mid-December 2017, and had another pullback (starting from the vertical cross hair line) that lasted until August 2017. During this second pullback period, XLE (on the right) was similarly declining. But throughout this time, as we know from the previous chart, the spread between the two was steadily rising. This illustrates the beauty of pairs trading: Regardless of the ups and downs of the individual prices of COP and XLE, the spread between them steadily increased, resulting in a continuous gain for our spread trade. This upward trend in the spread continued for another full year through August 2018, which is the end of the period covered by the chart. 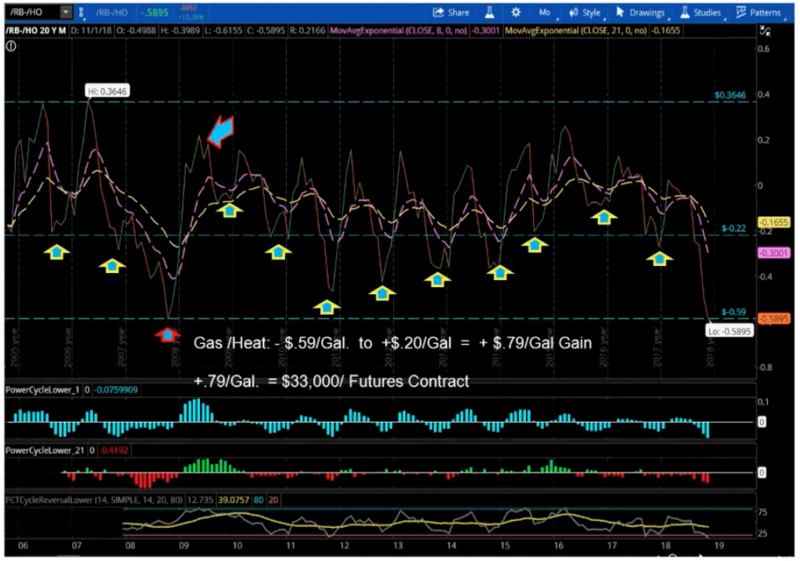 As a final example, let’s look at a seasonal pairs trade with RBOB gasoline futures (RB) and heating oil futures (HO). The energy sector always presents some great trading opportunities, even in down markets. This one comes around each year, when you can take advantage of a sharp increase in the spread of RBOB over heating oil that occurs during the period from about the middle of November to mid- or late December. As a bit of background: “RBOB” stands for “reformulated [gasoline] blendstock for oxygenate blending”; RBOB futures are the most common way to trade gasoline. One futures contract is for 1,000 barrels, which is equivalent to 42,000 gallons. Near the end of each year, RBOB gasoline outperforms heating oil, and so the spread displays a large upward move. The arrows on the chart mark the beginning of each annual move. To trade this move, you would go long on RBOB gasoline and short heating oil. Based on the historical statistics, this has been a winning trade in each of the last 15 years. As you can see, there is the potential for a huge upward move, which can be very profitable if you catch it properly. Take as an example the move marked by the two blue arrows with red outlines. At the beginning of the move, the spread of RBOB gasoline over heating oil is −$0.59 per gallon, and at the end of the move, the spread is $0.20 per gallon, for an increase of $0.79 per gallon. At 42,000 gallons per futures contract, that represents a gain of over $33,000 per spread. Note that the spread trends in the reverse direction in the middle of each year, when heating oil outperforms RBOB gasoline; this downward seasonal trend could offer another trading opportunity. The trades in this article are for education only and may not represent actual trades.